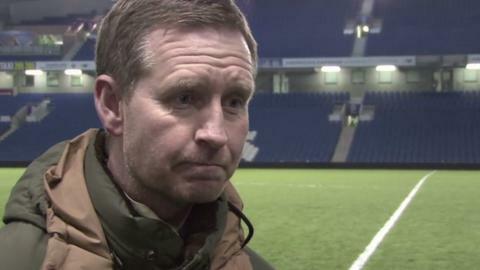 Paul Tait knows the pain of relegation, having been in the last Birmingham City side to be relegated to English football's third tier 20 years ago. But, with Blues facing a repeat if they lose at Bolton on Saturday, the popular former City midfielder still believes his boyhood team can stay up. "They can still get out of it," Tait told BBC WM 95.6. "I'm pretty confident Blues can get a result at Bolton. "Our home form is shocking but our away form is good. We've won nine away." Even if Blues do get a result at the Reebok Stadium, it would still need Doncaster Rovers not to pull off a shock at Championship winners Leicester City. - July 1971: Born Sutton Coldfield. - 1988: Signed for Birmingham City, going on to score 14 goals in 170 league appearances. - He earned his biggest headlines at Wembley in April 1995 when he hit the winner in the Auto Windscreens Shield win over Carlisle United, then removed his royal blue shirt after the game to unveil a t-shirt delivering an uncomplimentary message to Blues' second city rivals Aston Villa. He was fined two weeks' wages. - 1999: Also spent a short spell on loan at Millwall (1994) and Northampton Town (1997), before leaving Blues for Oxford United, going to score three goals in 91 appearances. - Also played in Cyprus for Nea Salamis. If Doncaster lose, Blues need just a point to stay up, while if it is a draw at Leicester, then Lee Clark's side must win. And, if Rovers were to win, then Blues would then be reliant on either Blackpool, who are at home to Charlton, or Millwall, who are at home to Bournemouth, losing. But Tait, who covers the majority of Blues' games for the club's own TV station, saw his old side win 3-1 at Doncaster a month ago. And he is convinced that champions Leicester will be too strong for them. "When I look at the squad we had in pre-season, I tipped us to struggle," he admits. "Although I didn't expect us to still be fighting relegation on the last day of the season. "But I've seen all Blues' games home and away, bar about three. And, from what I saw that day at Doncaster, I think we'll be ok.
"I'll be surprised if Doncaster get anything at Leicester." Nigel Pearson's side were perhaps guilty of taking their foot off the gas when, in the wake of finally sealing promotion last month, they promptly lost their next game - 4-1 at home to Brighton. But it is unlikely that lightning will strike twice in the same place on Saturday to further derail a Foxes side needing a point to reach their 100 for the season. All Clark's men can do is concentrate on winning against a Bolton side who have nothing to play for - and Tait's main hope is that the class of 2014 avoid the fate of Barry Fry's side in 1994, when they were in a very similar final-day predicament, but got relegated by a victory for neighbours West Bromwich Albion. "Barry Fry had taken over from Terry Cooper and we had been on a particularly bad run," recalls Tait. "We didn't win in three months. But we then went and won seven out of the last nine and drew the other two. "We had to win our last game against Tranmere to stand a chance and we won 2-0, but the Albion were at Portsmouth. They pulled a rabbit out of the hat and stayed up. "We went down and then came back up with Baz the following season. "Then Trevor Francis came in and all the big-name players started arriving and the rest is history." After Francis so cruelly failed with Blues being beaten three years in succession in the play-offs, Steve Bruce then came up to lead City to the Premier League at the first attempt - the first of three promotions in a decade spent yo-yoing between the top flight and the Championship. Since coming down in 2011, just weeks after winning the Carling Cup at Wembley, it has been a painful three years for Blues fans. Coupled with the club's well-chronicled financial problems, there has been a mood of apathy among some sections of the crowd, causing gates to plummet. But the words of the City fans' old song 'Keep Right On To The End Of The Road' still ring in the ears of the diehards and old faithfuls like Tait. "My kids told me they're going to support Liverpool and that they've had enough of supporting Blues," he said. "But I've told them to forget it. They're in for the long haul."